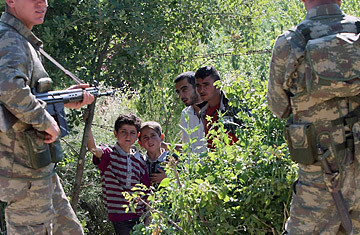 Turkish soldiers stand guard as a group of Syrian refugees wait on the Syrian side of the border for authorization to enter Turkey on Thursday, June 9, 2011. The young Syrian in the white undershirt cradled a toddler in his arms as he sat beneath a line of laundry strung up between two stout gum trees. He stared out from behind the rusty metal gate of the disused tobacco warehouse that is now home to hundreds of Syrian refugees, most of whom are from the flashpoint town of Jisr al-Shughour, some 40 kilometers south of the Turkish border. A gaggle of frustrated journalists waited across the narrow street from the warehouse grounds, prevented from speaking to the refugees by uniformed Turkish police officers as well as plainclothes security officials who briskly brushed away anyone who approached the gate. "I'm from Jisr al-Shughour," the Syrian man shouted in response to a question I yelled out in Arabic from across the street. "We came yesterday, we're seven families," he screamed, gesturing to the half a dozen young children playing around him amid the rows of neatly arranged white tents now covering the grounds of the old factory. "It's war, they're shelling civilians," he bellowed as a woman balancing a mattress on her head walked past him toward a tent, and a plainclothes Turkish security official in a green-and-white striped shirt hurriedly approached him. The official stood over the refugee for a few moments before leaving. "Tell me what you saw in your village and along the road to Turkey," I screamed, cupping my hands over my mouth in a bid to carry my voice further. The refugee didn't answer. Instead, he held his hand up to his mouth and shook his head, in a gesture that meant he could no longer speak. "Did they prevent you from talking to me?" I asked. He nodded his head. "I'm just an employee, I'm doing my job," a plainclothes officer later told TIME. "The government says you can't talk to them. We have orders." More than 2,790 Syrians have streamed across the border into the southern Turkish province of Hatay, the state Anatolia News Agency reported Friday. The government has established two camps, one in Yayladagi, the other in Altinozou, and is planning a third, the agency said. The Turks clearly expect a mass exodus in the coming days and weeks. The Hurriyet daily reported on Friday that the government may establish a buffer zone in the southern border area "if hundreds of thousands [of Syrians] want to seek refuge in Turkey." That may happen sooner rather than later, given that Syrian state media announced on Friday that an anticipated military offensive had begun in Jisr al-Shughour, a restive Sunni town of some 50,000, "in response to the inhabitants'... call for help." Damascus says "armed gangs" in the area killed more than 120 security personnel last week, a claim vociferously denied by Syrian rights activists who say the killings were due to mutinous units of the military who, rather than shoot unarmed protesters, turned their weapons on their colleagues. Abu Fady, a resident of Khirbet al-Jouz, not far from Jisr al-Shughour, reached by phone Friday said food supplies were low and that hundreds of people were leaving the village, heading for the Turkish border. "People are scared," he said. "and we should be scared of this regime." Abu Fady said there were hundreds of military vehicles amassed on the Syrian side of the Turkish border, to intimidate or prevent people from crossing. "This is intolerable," he said. "I want to get my family out of here tonight." France and Britain are rallying support at the United Nations Security Council for a resolution against the regime of Bashar al-Assad, while once-staunch allies of Damascus like Turkish President Recep Tayyip Erdogan have distanced themselves from the Syrian leader. Erdogan has steadily upped the tempo of his criticism. The images from Syria were "unpalatable," Erdogan told Turkey's ATV television on Thursday night. "They are acting in an inhumane way," he said, referring to the Syrian regime and suggesting that Turkey could support any U.N. move against Assad. "In the face of violence, we cannot continue to support Syria. We have relatives living in Syria," he said. There are, in fact, blood ties that bind residents of the Turkish-Syrian border, many of whom on the Turkish side are ethnic Arabs. "Hassan," an 18-year-old Syrian, who said he was from Khirbet al-Jouz, sat along the low concrete wall of a flat-roofed home in the sleepy Turkish hamlet of Guvecci, about 20 minutes drive from the Yayladagi camp. He was red-faced as he squinted into the mid-morning sun, beads of sweat clung above his blonde brows. The young man said he'd walked across the border half an hour ago, to find his Turkish relative Abu Omar, who would help him buy bread. "I just came to get bread and to return," Hassan said. "In our town, there's no food, no bread. When we see the army, we hide, they're shooting at people." Hassan refused to present his national Syrian ID card, saying he feared the consequences of divulging his identity, despite a pledge from me that he would remain anonymous. It's unclear how he managed to evade the Turkish soldiers spread out in the lush fields between the village, which hugs a gently sloping hill, and a paved road in the valley that demarcates the Syrian border. A hilltop Turkish military outpost sits adjacent to Guvecci's handful of houses. On Friday, a military truck could be seen loading Syrians gathered at the border road, as vehicles, mainly ambulances, continued to stream across the hill from Syria into Turkey. The military kept the media at a distance. Aisha Gur, sat under a leafy grapevine in the small courtyard of her home in Guvecci. The 45-year-old's modest abode was one of the closest dwellings to the border road, which could be accessed from a steep, sloping village pathway covered in loose stones and animal dung that passed alongside Gur's home. A small flock of sheep meandered along the track, toward an olive grove near flowering orange pomegranate trees. "Look, see that ambulance." Gur said, pointing out toward the road. "We've seen lots of ambulances coming from Syria lately," she said, "but none of us are allowed to speak with the people in them." The refugees picked up from the informal border post at Guvecci were destined for one of the two nearby camps. As the hours passed, several mini-vans full of tired-looking Syrians disgorged their passengers inside the grounds of the Yayladagi camp. A man inside the fenced tent city limped past on a single crutch, his right foot bandaged. He said he was from Jisr al-Shughour, had been shot by Syrian security forces, and had crossed the border overnight. "The shabihha and security have surrounded us," he said referring to armed gangs of Assad loyalists. It was clear that the man desperately wanted to speak, but a uniformed Turkish policeman was quickly heading toward him. He sighed as he watched him approach. "I can't speak to you," he said. "I want to, but I can't." See pictures of protests in Syria. Read about the differences between Syria and Turkey.